Last Updated: August 8, 2017 | Subscribe to our weekly newsletter! When you’re ready to close your pool for the season, you’ll need to perform a few tasks to make sure your pool stays healthy during the off season. You’ll clean the pool and water, add winter chemicals, and do a few other things before the final step—covering your pool. But are you using the right type of cover? During the off season, your best option is a safety cover. Not only will it protect your pool, it will prevent animals and small children—or anyone, really—from falling in and getting trapped beneath a non-safety cover. Previously, you had just two choices: mesh or solid. But now you also have a third option—a hybrid safety cover—which combines some of the most desirable features of mesh and solid covers. Once you know a little more about each type of pool safety cover, you’ll be able to choose the best one for your pool. Once you’ve properly installed them, you could drive your car onto some pool safety covers, and it wouldn’t fall in. While that may sound like a pretty exciting way to spend your Saturday night, we don’t recommend trying it yourself. CAUTION: Seriously, please don’t do this. Not all pool safety covers are created equal, and some are much stronger than others. Their weight capacity also depends on their being installed correctly, and numerous other variables. Only use your pool cover for its intended purpose. The point is, if something larger than a few twigs or leaves—say, a large tree limb—were to fall on your pool during a heavy storm, the safety cover would support it and keep it out of the water until you’re able to remove it. The hope is that nothing will be able to climb under the edge of the cover to get into the water, either, but this will depend greatly on how taut the cover is, and how well it’s installed. Some critters can manage to squeeze through the smallest spaces, so there’s no guarantee you won’t uncover your pool to find a few new friends in the water. Usually one of the more affordable options, a mesh safety cover can last 15 years or more with proper care. They’re fairly light, so they’re the most manageable of all safety cover types. Despite their lighter weight, mesh covers can often support thousands of pounds. Designed to prevent water from collecting on top of the cover, mesh covers allow rain and melted snow to drain right into your pool. However, the mesh is woven tightly enough to allow debris to settle on top. Even though the rain will get through, you won’t have sticks, leaves, and bugs on the bottom of your pool come spring. You will have some fine sediment to vacuum up when you open your pool, though, as a mesh cover is not impervious to dust and dirt. Mesh safety covers vary in their specifications when it comes to sunlight. Some are simply resistant to the sun’s destructive ultraviolet (UV) rays. Others are created to block as much as 99 percent of sunlight. Why would you want to keep the sunlight out of your pool? Doesn’t the sun help warm your pool? Well, sure, and that’s great when you’re actually using the pool. But off season, it can be detrimental. Sunlight is a critical ingredient for algae growth. The last thing you want is to turn your pool into a giant greenhouse for algae. Before closing your pool, add an algaecide (algae killer) or algaestat (algae preventive) that will stay in your water for an extended period. This way, you’re fighting algae for much of the off season without having to remove your cover at all. By the way, if you already have algae, don’t close your pool yet! If you close it “green,” you risk allowing algae to grow unchecked for months, leaving you an even bigger mess to clean up when you open it next season. Instead, get rid of pool algae first, then close your pool when the water is crystal clear. Solar pool covers float on the water’s surface. Vinyl pool covers drape over it, sometimes held in place by large water bags. But pool safety covers are stretched taut, then strapped into place. CAUTION: While a pool safety cover’s primary purpose is, well, safety, its ability to prevent accidents has a lot to do with environmental conditions. For example, if the pool’s water level is high after a heavy rain, it may be possible to sink into the pool from atop the safety cover. Always exercise caution around your cover. We can’t stress enough how important it is to ensure your cover fits your pool. To do this, measure your pool at its widest and longest parts. Then, select a cover in the correct size and shape. If you have built-in water features or other special considerations, you’ll need to check what the manufacturer recommends. Some covers include panels that help prevent gaps created by such obstacles. The only way to be sure people are safe around your pool during winter is to properly install your safety cover. The straps that hold it in place won’t help much if the hardware that anchors them down isn’t installed the right way. Installation varies a bit between inground and above ground pools. If you have an inground pool, you’ll install anchors directly into the pool deck. First, follow the plan that comes with your cover to mark where anchors will be placed. Next, drill holes on your marks. If you have cement, wood, or pavers on sand, you’ll require hardware specific to your pool deck. Water features will also require special hardware you can get from the pool cover manufacturer. Install all the anchors per instructions, then attach the springs to the anchors. Your cover will come with a tool used to stretch the springs out onto the anchor. They’re much too tight to stretch them by hand. If your inground pool doesn’t have a deck, you can pour concrete footings where anchors will be placed. If you have an above ground pool with at least two feet of decking, you can buy a mesh safety cover with special brackets you secure to your pool deck. You’ll pull the straps across the deck, and use a special tool to slip the looped end of the strap over the peg on the deck. CAUTION: Even if you’re a seasoned do-it-yourselfer, the right fit and correct installation for your pool safety cover are critical to its function. An error in either of these areas increases the probability of accidents. If you’re at all concerned about fitting and installing a pool safety cover yourself, consider calling a professional installer. Once you’ve got the cover on your pool, you just leave it alone until spring, right? Not exactly. 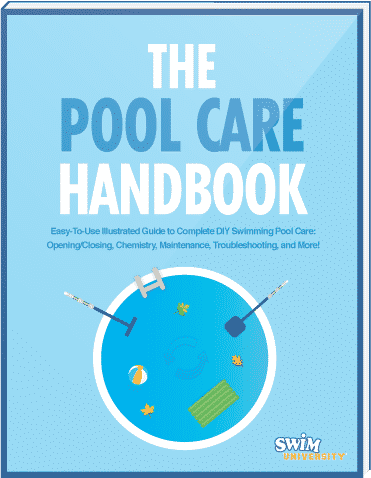 A little basic upkeep will extend the life of your cover and protect your pool. If you live somewhere snowy, you must remove snow from your pool cover. It’s best to push it off with a broom before it piles up. Snow can become very heavy, especially when the bottom layer freezes. Regularly brushing off your safety cover will prevent ripping, tearing, and destruction of your anchors from constant stress. If you don’t get much snow, you can blow dry debris off the top of your mesh cover with a leaf blower. When you reopen your pool, be sure to remove, clean, and store your mesh safety cover properly so it’ll last. An impermeable barrier between your pool and the sun, rain, snow, and debris, solid safety covers promise you a cleaner pool opening. Nothing’s getting past this guy. Because they don’t allow any water to seep into your pool, it must be pumped off the top of the cover regularly. Despite that extra bit of maintenance, they offer some helpful benefits. While mesh covers allow a little bit of sunlight and sediment through to your pool water, solid safety covers block it all. This means you won’t have dirt collecting on the bottom of your pool all winter. Plus, algae growth and evaporation will be inhibited by blocking out the sun and wind. However, the lack of drainage can create a giant puddle in the middle of your cover. Leaving that water to sit can not only damage the cover, but will make removing it nearly impossible. It also poses a drowning hazard—the very thing you’re trying to prevent with a pool safety cover. Part of the reason solid safety covers cost more than mesh is they typically come with a pool cover pump. You’ll put this pump on top of the cover, in the middle where water tends to collect. When that happens, the pump gets rid of it. Automatic pumps kick on by themselves when water builds up, but they cost a bit more. Manual pumps are a budget-friendly alternative. Either one will help prevent water from collecting on your cover. To achieve the best fit, begin by measuring the longest and widest parts of the pool, then choose the shape and dimensions that best suit your pool. Take the location of steps or ladders into account when choosing your cover. A solid safety cover is installed the same way a mesh cover is. Again, if you have water features, ladders, or other things impeding the cover from lying flat you’ll want to make sure the cover will fit properly by contacting the manufacturer. Different deck types may require special hardware for anchor installation as well. CAUTION: If you’re at all unsure about what hardware you need for your deck type, or how to fit your pool safety cover around obstacles, consider calling in a pro to ensure the cover is installed correctly. Improper installation increases the chance of accidents. As with any other pool cover, you’ll want to make sure you blow or brush debris off regularly. Make sure you don’t allow snow or ice to build up on top of your solid safety cover because it can damage the cover, your cover pump, the anchors, and even the pool itself. The process of removing, cleaning, and storing your solid safety cover is also similar to that of a mesh cover, except that you can clean your solid safety cover while it’s on your pool. Use water, a brush, and mild detergent if needed. You can rinse the soap and debris with a hose, then use the pump to remove all the soapy water. When it’s time to remove and store your solid safety cover, you may need at least two strong people because, depending on the cover, it can be very heavy. Some solid covers are made from lighter material, though, which helps ease this task. The most important difference between mesh and solid safety cover maintenance is the pool cover pump. Some pumps come with suspension cables to keep them in place, while others have a rope to pull the pump in when needed. CAUTION: Never pull your pump around by the power cord. Electricity plus water equals ZAP. Cover pumps attach to a standard hose so you can direct the water wherever you need to. Cover pumps are rated in gallons per hour (GPH), which helps you figure how often it will need to run to keep your cover water free. Whether your pump is manual or automatic, you’ll need to check it throughout the off season to be sure it’s working properly. Even if your pump has filters, it could become clogged and stop pumping water. Periodically remove the strainer, filters, and other parts per your pump’s instruction manual, and clean everything thoroughly. If you suspect a clog, but can’t find it, try putting your pump in a bucket of water and turn it on. If your hose might be clogged, attach it to your outdoor spigot, then turn the water on. This can help flush it out. If you live in a climate where winter temps regularly drop below freezing, you may need to bring your pump indoors until the temperature rises. Leaving your pump to freeze in a block of ice isn’t a good plan. When it’s time to open your pool, you’ll find the water clearer and cleaner than it would be if you had used a mesh safety cover. If saving time opening your pool in spring is your main goal, then a solid safety cover will be the best choice for you. If you want the benefits of a solid pool cover without having to pump water off it all season, the hybrid safety cover is the solution for you. Instead of using a pump, hybrid covers feature mesh panels that allow water to drain into your pool. With all the safety features of their cousins, hybrid covers also block most UV rays while keeping out all debris but the finest silt. They look just like solid safety covers, except for a mesh panel (or a row of mesh panels) in the center. The mesh is very tightly woven, so water drains into your pool, but debris stays out. They’re also quite light and easy to manage. Basically, with hybrid safety covers, you get the best features of mesh and solid covers wrapped into one. Installed the same way as their predecessors—hooked securely into permanent anchors in your pool deck—hybrid covers are just as safe and sturdy. Measuring and fitting remains the same. Some manufacturers offer computer-aided custom fit for more complex pool shapes and features. Because hybrid covers drain through mesh panels, you won’t need a pool cover pump at all. Removal, cleaning, and storage is the same as with a mesh safety covers, so just pop it off, wash it down, and once it’s dry, fold and store securely. It’s a sad fact that approximately , 3,536 people drown every year in the United States. Most drowning victims under the age of five drown in home swimming pools. Even if you don’t have children living in your home, you may have visitors who bring their small children, or neighbors whose small children could find their way into your yard. Play it safe, and make sure your pool is covered properly when closed. In 2007, The Virginia Graeme Baker Pool and Spa Safety Act was signed into law in the United States. It sets forth safety standards required in U.S., as well as suggested state pool safety regulations, such as alarms and pool safety covers. While state laws are changing, you can refer to the guidelines in the act created by the Consumer Product Safety Commission, to help make your pool area safer. ASTM International sets performance specifications for pool safety covers in this guide. ASTM International is a non-profit organization that develops voluntary consensus standards for numerous consumer products. Their more than 30,000 expert members create these industry standards for consumer safety. Whatever pool safety cover you choose, make sure it meets ASTM standards. Their reports are available for a fee, but when it comes to keeping kids and pets safe, it’s well worth the cost. Some pool cover manufacturers choose to have their safety covers undergo rigorous testing by Underwriters Laboratories (UL®) in order to ensure they conform to ASTM standards. If their pool cover meets or surpasses those standards, their product will be awarded the UL® seal of approval. Look for the seal when shopping for a cover so you can feel at ease about its quality and anticipated level of performance. Which Pool Safety Cover is Right for You? If an easy opening in the spring is what you’re after, and you can handle moving and storing a heavy cover, then solid is the best choice for you. Prefer the lightest option available and don’t mind some extra work to open your pool? Choose mesh. Or maybe you want the best of both worlds with a cover that’s a manageable weight, while still blocking UV rays and most debris. Then a hybrid cover is your best bet. Of course, the price will also be a consideration, and here, pool safety covers vary widely. Not only will your cost depend on the type of cover you choose, but on the brand and its features. With its primary purpose being safety, you’ll benefit from seeking out high-quality, reputable brands. Also, covers with the coveted UL® seal of approval may be a little more expensive than those without, but the peace of mind will be worth the additional cost. Regardless of which type of pool safety cover you decide works best for your pool and lifestyle, you’ll sleep soundly knowing your loved ones and pets are safe from pool accidents. The purpose of a pool air pillow is to protect your pool from potential rain, snow, and ice damage over the winter. Learn how to install a pool air pillow. Think you can just cover your above ground pool, and it'll be fine until spring? Think again. Do just a few more things, and opening will be a breeze. Thinking about not closing your pool in winter because it seems overwhelming? It's not only easy, it's necessary for your pool's—and your—health and safety.